The second volume in The Snopes Trilogy was written seventeen years after The Hamlet, the first book in the trilogy, but it takes up within a few years of where The Hamlet leaves off. Again, it feels like a series of stories related to the people of the town and a few who are dea although these stories are more integrated – there’s more of one plot, however convoluted. the main characters are Charles Mallison (age about 5), Uncle Gavin (Stevens, about age 35), Will Varner (the old rich guy from The Hamlet, father of Eula), Manfred deSpain (Jeffereson’s mayor and perhaps the lover of Eula Snopes, married to Flem), Flem Snopes (new rich guy from The Hamlet, owner of much) , I.O. Snopes (nice guy), Wallstreet Snopes (shopkeeper wanna-be), and Linda Snopes (the 16-year old daughter of Eula Snopes) have prominent roles. As with so much of Faulkner I’m reading along and thinking I’m going to have to read this again to make any sense of it when suddenly something breaks clear and I get a sense of comprehension. Whew! Charles (Chick) Mallison (age about 5) lives with his parents and his bachelor Uncle Gavin, the twin of Charles’ mother. Flem and Eula Snopes live with their two children not far away. Linda Snopes is their 16-year old daughter (at least she’s Eula’s daughter) and it seems that after falling in love with Eula, Gavin falls in love with Linda. But Flem Snopes is a clutching man – he wants to be somebody to reckon with. From poor white trash in The Hamlet to the vice president of the bank and owner of a lot of other stuff in The Town, Flem Snopes is an interesting character. He wants what he wants what he wants and he wants it known in Jefferson that he owns it all – even the people, like furniture. 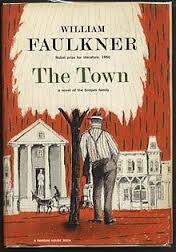 Faulkner is digressive and repetitive. Then he skips over parts and comes back to them later. His sentences can be long and convoluted or they can be “…he said,” “…she said.” But he’s also brilliant. The themes which I suppose are developing are the development of the post-Civil War south. Gone is the plantation economy and the antebellum society. Arriving are the new powers, the bankers and lawyers and businessmen many of whom, driven by greed, rose through the ranks from poor white trash, i.e. the Snopes family. The goal is “respectability,” as well as riches and political power. The old names are gone and Flem Snopes is the prime example of a man who wants what he wants and gets it however he can.